When midsummer hits, I avoid cooking like the plague. My husband and I forgo the kitchen for the grill and eat whole fruits and vegetables as snacks as much as we can. Right now, our fridge is filled with black raspberries picked from our backyard and snap peas and cucumbers from the market, all of which are wonderful without help from a hot stove. When I do need to heat something, I prefer to do it in bulk — making big batches of rice, beans and pasta that I can eat all week at room temperature, and blanching whole pots of veggies for use with the starches and legumes. Armed with a fridge full of these, you can produce an amazing variety of healthy, nourishing dishes with the addition everyday condiments or a quick, whisked-together sauce or dressing. But about the market. Greens are coming into their prime now, as are beans, cucumbers and summer squash. 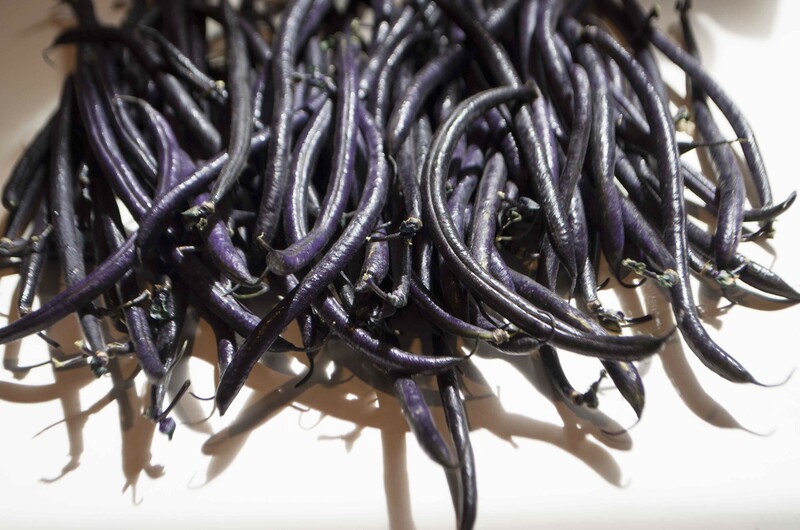 Last week at Barre Farmers Market (which I still maintain is one of Vermont's best — small but wonderful), I grabbed a pound or so of gorgeous purple haricot verts and blonde cucumbers from LePage Farm. 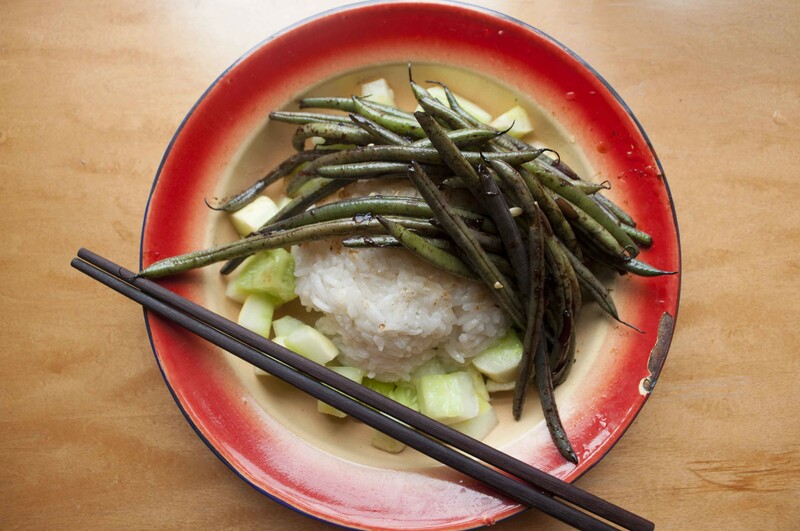 Today, I threw both over coconut rice for a light, easy-peasy summer lunch, which is, like so many of my other Farmers Market Kitchen recipes, endlessly variable. No beans? Use kale, broccoli rabe, bok choy, spinach (this will take far less time to cook) or cabbage. No cucumbers? Use apples, honeydew, pears or firm peaches. Even halved seedless grapes would work! Here's the non-recipe recipe, which will serve about one person per five-inch cucumber. So for two, you'd need two five-inch cucumbers, or one 10-inch cucumber. Peel and cut into 3/4-inch pieces one nice, fat summer cucumber. Place the pieces in a bowl, sprinkle with sea salt and soak with the juice of half a lemon. Let sit, stirring occasionally, while you prepare the rice and then the beans. Make the rice* and allow to cool to room temperature. Heat a cast-iron skillet on high heat until it is blisteringly hot. Splash in enough extra-virgin olive oil to coat your beans (probably about two tablespoons) and about half as much toasted sesame oil. Add half of a medium onion, diced, and reduce heat to medium. Turn the onions a few times until they are browned, then splash them with no more than a teaspoon of rice or other vinegar and stir. Add the beans, douse them with tamari and no more than two tablespoons maple syrup, plus some red pepper flakes, then stir again. Cook uncovered for a few minutes, then turn the beans and cook a few more minutes. Repeat until the beans begin to soften but retain their crisp. When they reach your preferred consistency, deglaze the pan with a good splash of whatever white wine you have on hand (a light beer would also work) and kill the heat. Form a handful of cooled rice into a ball and place in the middle of the bowl. Surround with lemony cucumber pieces. Top with the warm beans, then pour the remaining lemon-cucumber liquid over all. Garnish with kimchi or sriracha or nothing at all! To get perfect rice every time, I cook it Latin American-style, no matter what I'm serving it with. The method is easy: Place rice in a large bowl or sieve and rinse in cool (not cold) water until the water runs clear. This can take a while, so have patience. When the rice is adequately rinsed, drain thoroughly (if using a sieve, pat the bottom until it stops dripping). Mince one small clove of garlic and/or one small onion (per cup of rice), and/or half a bell pepper. Heat two tablespoons oil (coconut oil, if making coconut rice) per cup of rice in a large pan over medium heat. Add the garlic, onion, etc. (If making ginger rice, omit the onion/pepper and substitute about one teaspoon of freshly grated ginger), and sauté until the onions are clear, 3-5 minutes. Add the rice and fry (no water yet) until the rice just begins to brown, 7-8 minutes. Dust amply with salt. Add water so that it covers the rice by about half an inch. Stir gently to mix in the salt. Cover and cook over medium-low heat (do not stir!) until the water is absorbed and the rice is soft, 10-15 minutes. Keep an eye on it, as you may need to add a little more water, 1/2 a cup at a time, if it cooks too quickly. What to Do With Garlic Scapes?